Coffee shops and food trucks have long been staples of the Treasure Valley food scene, but Canyon County entrepreneurs Dustin and Angie Mori recently felt that scene was missing something. So after doing some research, the couple decided to add to the scene not a food truck, but a food bus, and not just any bus, but a completely mobile double decker coffee bus! The Moris launched Double Decker Espresso in late 2018, with the family serving up coffee and treats inside an eye-catching, bright red English icon on wheels--even though they admit, they've got zero background in big British buses. Angie laughs, "We'd never been on a double decker, we'd never seen a double decker, until we bought one." But the Moris loved the idea of a mobile food business because of its originality, its mobility, and its flexibility for homeschooling their six kids. "Trying to develop a sustainable business that works for our family is what we're working for," Angie says. So how exactly do you go about getting a 12-ton taxi from across the pond? Where else but the internet, of course! Angie says, "We followed a rabbit trail, found a guy who knows a guy in England and said, 'I can ship it over for you.' [The bus] landed in Baltimore, drove across the country, and then we went and picked it up in Utah to drive it home." As you can imagine, though, there was a learning curve to figuring out how to drive a European vehicle on American roads. Dustin, the main driver of the double-decker, admits, "It's kind of nerve wracking at first," but Angie says, "He acted from the very beginning like he's always driven on the wrong side of the road." The bus was originally built in 1989 and did need a little TLC on the interior, like fresh paint and new seating. Now, you'll find a bright, bustling coffee shop on the first floor, where the Moris hand-craft drinks from beans they roast themselves and offer up amazing homemade treats like cinnamon rolls, cookies and muffins. Head up the narrow staircase to floor two, and you'll find a cozy space where people can sip lattes, play games, and connect--to each other, not to WiFi, since you won't find a free internet connection on this bus. "We love it when people come up here and hang out," Angie says, "[especially] when they hang out it an interactive way instead of a techy way." As you can imagine, the double decker gets a lot of double-takes when rumbling down the road, but the Moris say their company's unique curb appeal is exactly what makes this business--inspired by Britain--perfectly at home in Idaho. "We encourage people to come and be a part of it," they say. 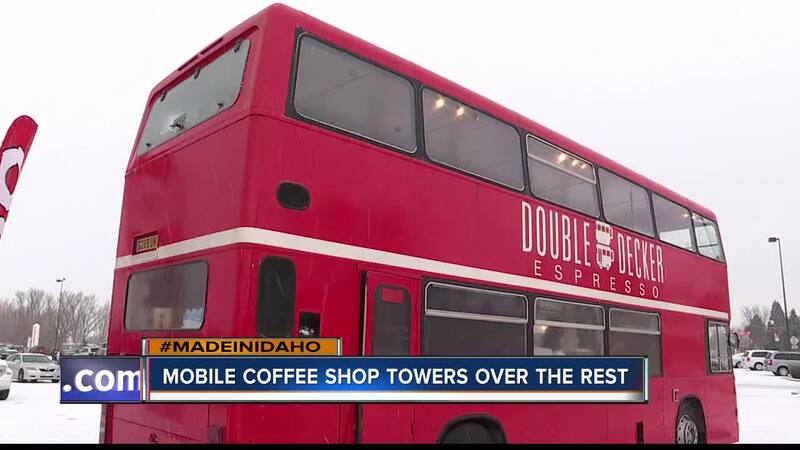 Double Decker Espresso makes multiple stops all across the Treasure Valley each week, from Middleton to Nampa, and now into Boise as well. For a full schedule of where you can find them each week, visit their Facebook page here .